A German newspaper Gründtadter Sonntags-Spiegel has published an article about Nicole Kaucher, Christian Haag and Deva Senguenthree who are all students of Irina Woronow. It is great to see such interest from the local media and many congratulations to the young stars and their teacher! 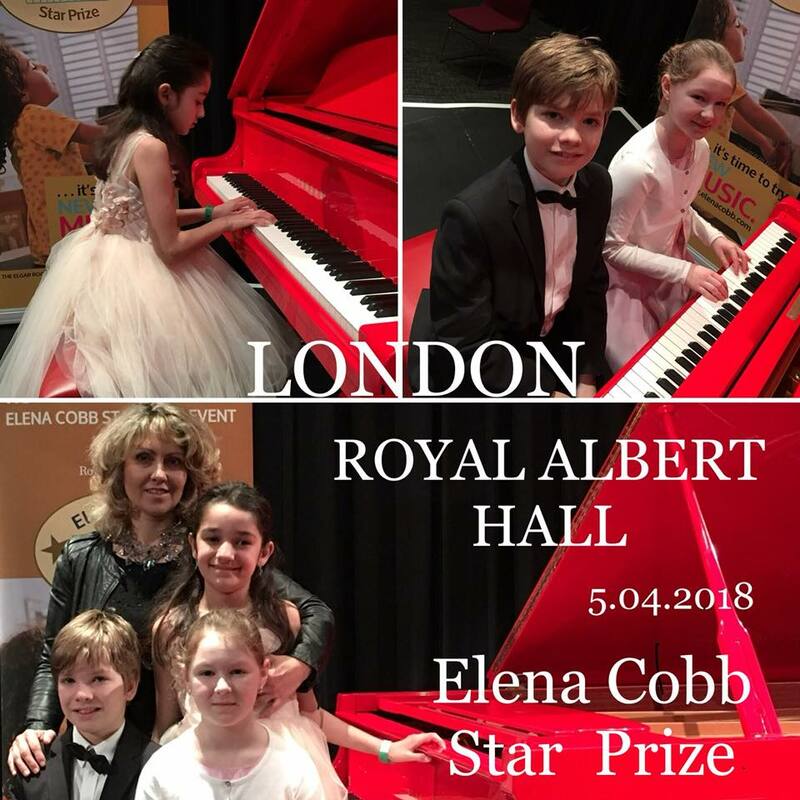 Their piano trip to London where they performed at the Elena Cobb Star Prize Event at the Royal Albert Hall Elgar Room on 5 April 2018, was a success! For an experience of a lifetime, three young pianists travelled to London, accompanied by their teacher Irina Voronov. At the beginning of April, the legendary Royal Albert Hall hosted the ‘Elena Cobb Star Prize’ concert. 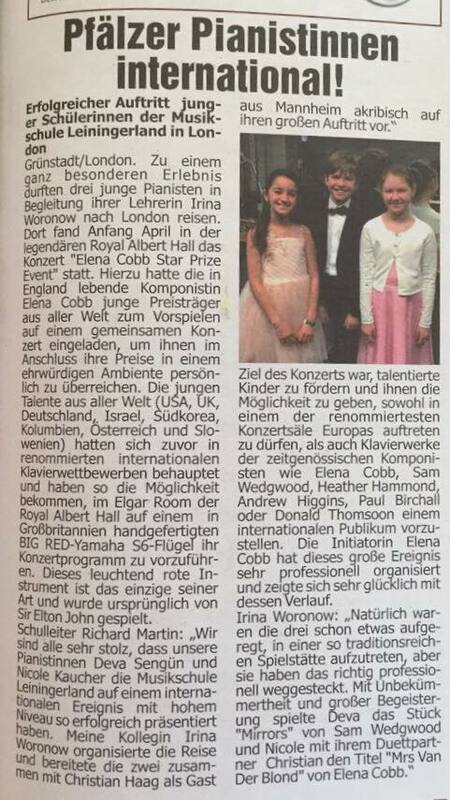 The composer Elena Cobb, who lives in England, invited young pianists from all over the world to perform together and to personally present their prizes to them. The talented young players from the USA, UK, Germany, Israel, South Korea, Colombia, Austria and Slovenia had previously performed in prestigious international piano competitions and now had the opportunity to perform at the Elgar Room of the Royal Albert Hall on a handcrafted BIG RED Yamaha S6 grand piano to show off their concert program. This bright red instrument is the only one of its kind and was originally owned by Sir Elton John. The aim of the concert was to promote talented children and give them the opportunity to perform in one of the most prestigious concert halls in Europe, presenting piano works by contemporary composers such as Elena Cobb, Sam Wedgwood, Heather Hammond, Andrew Higgins, Paul Birchall and Donald Thomson to an international audience. The organiser of the event Elena Cobb was delighted with its outcome. Please read students performer profiles on my LinkedIn page here. This entry was posted in News and tagged Elena Cobb Star Prize, Gründtadter Sonntags-Spiegel, Irina Woronow.